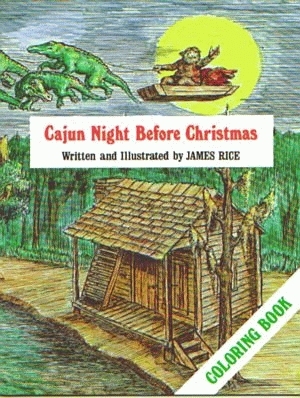 It’s the night before Christmas in a tiny shack on the Louisiana bayou, and Santa Claus, with his eight friendly alligators and toy-laden skiff, is on his way. Written in lively Cajun accents, the best-selling Cajun Night Before Christmas® is a beloved holiday classic. Now, with this innovative coloring book, children of all ages can put their own colorful spin on the story. These brilliant illustrations are sure to inspire some wide Cajun smiles. James Rice, in his long, distinguished career as an author and illustrator, has produced fifty-plus children’s books, among them illustrations for an addition to the Night Before Christmas Series, Gullah Night Before Christmas. With millions of copies of his books in print, he ranks among the nation’s best-selling creators of children’s books.